Christmas dinner is one of the most anticipated meals of the year – but how many people forget to defrost their turkey overnight, or have kitchen nightmares turning this special day into more of a misery? As I said in Part 1, the guide to a successful, stress-free Christmas is all in the planning. Before the traditional turkey, people would eat a pigs head with mustard on Christmas Day in England; nowadays we cook 10 million turkeys, and eat upto 9,875 tonnes of brussel sprouts at Christmas. While some people may choose to cook a smaller bird such as a goose, you still need to consider defrosting and cooking times. In a fridge at 4ºC/39ºF allow approximately 10 – 12 hours per kg, but check the temperature of your fridge first as it may be different. In a cool room (below 17.5ºC/64ºF), allow approximately 3 – 4 hours per kg, but longer if the room is particularly cold. At room temperature (about 20ºC/68ºF) allow approximately two hours per kg. 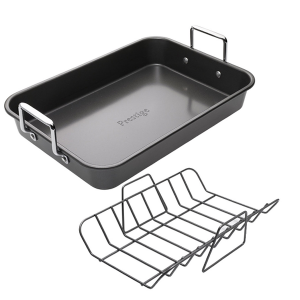 A good roasting tin is essential, such as this Prestige Roast n Rack. The great thing about this is that it allows the juices to drip to the bottom of the pan, allowing you to choose whether you want to use them for the gravy or not. The rack allows you to easily move what you are roasting out of the tray, and you can place the tray onto a hob to make a gravy. Allow 45 minutes per kg plus 20 minutes for a turkey under 4.5kg. Allow 40 minutes per kg for a turkey that’s between 4.5kg and 6.5kg. Allow 35 minutes per kg for a turkey of more than 6.5kg. Add extra time for a stuffed bird, and don’t forget to let it rest once it’s cooked. When cooking goose or duck the oven should be hotter to melt the fat under the skin. 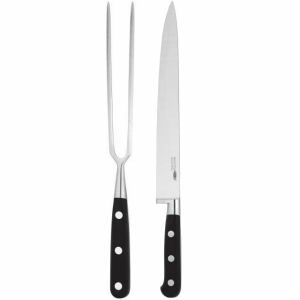 Once you’re ready to serve your chosen meat at Christmas, you’ll need a good carving knife set, such as this one from Stellar and Sabatier. It it always best to sharpen your carving knife each time before you use it, as this will ensure that you have perfectly cut slices. Other things you could do is to prepare your veg the night before and leave them in saucepans filled with water. If you make your own chestnut stuffing, this could also be made the night before. Don’t forget the cranberry sauce and mulled wine for Christmas Day, to make the experience complete. carving knife, Christmas, Christmas prep, dinner, roasting pan. Bookmark.